Welcome, my name is Mark, and this is my website covering my growing interest in beekeeping, along with the products produced by a beehive (beeswax/honey/propolis). I also show what can be made with the beeswax for example, beeswax candles, wax-jack & bougie-box tapers and polish. The other area covered is microscopy, as a beekeeper, looking at pollen under a microscope is fascinating, and if a sample of pollen is collected from a bee returning to the hive, once identified, the pollen provides a good indication on what the bees have been foraging. When the population of bees increases, (if the weather warms up), I also intend to carryout dissection of the bees and then study them using a microscope to 'understand' them more, along with trying to identify any diseases they may have. A recent addition to this site, covers the use of a 3D printer to make bespoke candles moulds and beehive parts. There are many types of bee, and as a beekeeper I look after beehives containing honey bees, also known by their Latin name of Apis Mellifera, which particular 'type' or sub-species of honey bee I have is a debatable, as I doubt they are pure bred honeybees. If you are a beekeeper, and would like me to examine your bees for Nosema and Acarine please contact me for further information. A sample of at least 30 bees will allow both diseases to be diagnosed. Photo's of the samples can also be provided. Check back regularly, as this website is growing steadily. In the meantime, if there’s something you want to know, please use the contact us link. 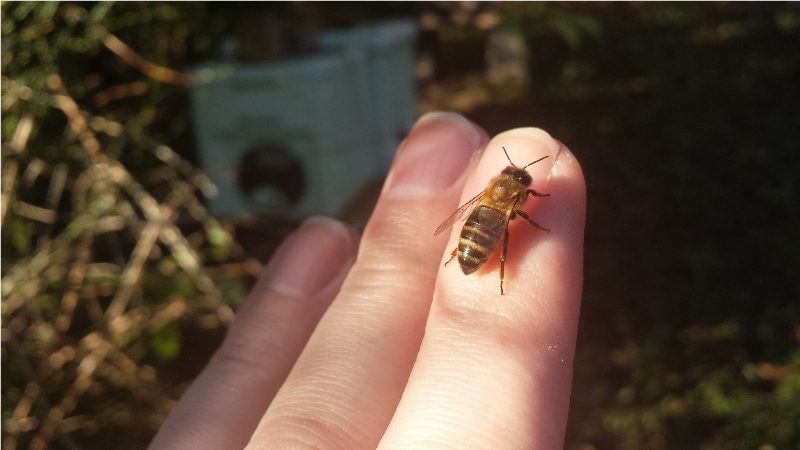 While you enjoy this website think of how gentle honeybees can be, below is a picture I took of a honeybee on my fingers enjoying the sun in January 2014. In the background you maybe able to make out the two pale green painted hives. Have a look here to see a live webcam of the beehives. I would like to know what you think of this website, and what you have come here for. I am getting around 100 visits per month from around the world. My most popular page is the wax tapers. Please get in touch and let me know what else to add. The complete list of updates to this site are here.